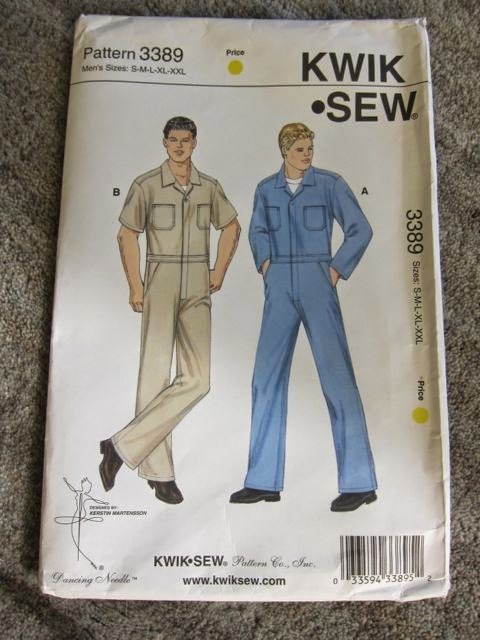 Last year I purchased Kwik Sew 3389 with the intention of making a pair of coveralls, and I've finally decided the time is right. I spent the last two days working on them and hope to finish them tomorrow. 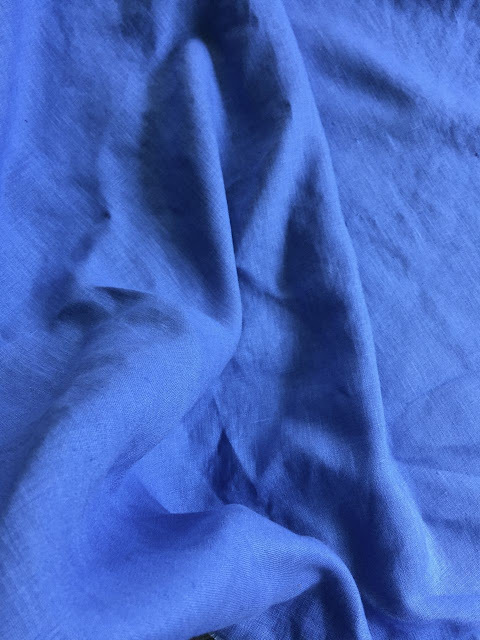 I'm making mine out of a beautiful blue linen rather than a more utilitarian fabric. The Kwik Sew instructions are very clear and I've made only a few alterations to the pattern, mainly shortening them a little in the chest, the waist, the rise, and the inseam. Since it's all one piece, it has to fit: there aren't many places to adjust it. I'm not sure I'll be wearing these over other pants but I'll probably wear them over a shirt; I have to see how they look when they're finished. The sewing has gone well but there's a lot of seaming (and many of the seams are reinforced with rayon binding) and topstitching, not to mention side pockets and patch pockets -- it all takes time and this somewhat loosely woven linen is a little hard to handle (and prone to fraying and growing). I'm really looking forward to getting these finished and seeing how comfortable I am wearing them -- it's a new type of garment for me. The linen makes them very cool and, since they cover most everything else, an easy thing to pull on for a summer morning dog walk. We shall see. 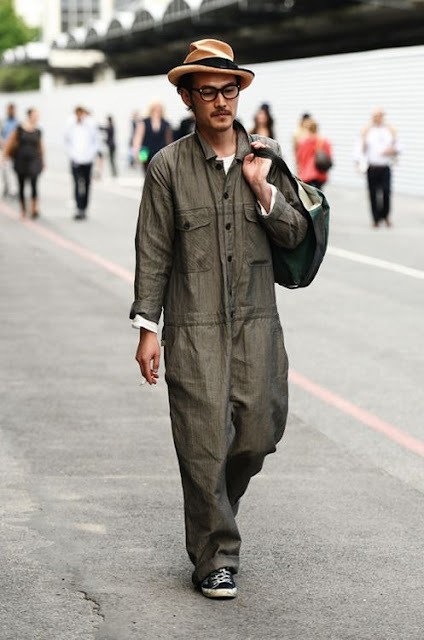 Does any guy you know wear coveralls (as fashion, not uniform)? Being in the Deep South, backwoods, I know plenty of men who wear coveralls, but none as fashion. They are all strictly worn to "cover all" their clothes while working, especially in traditionally greasy, dirty type jobs. Then one rarely sees "fashion" at all here regarding men, unless I drive an hour into Atlanta. :) Another excellent sewing job you've done! 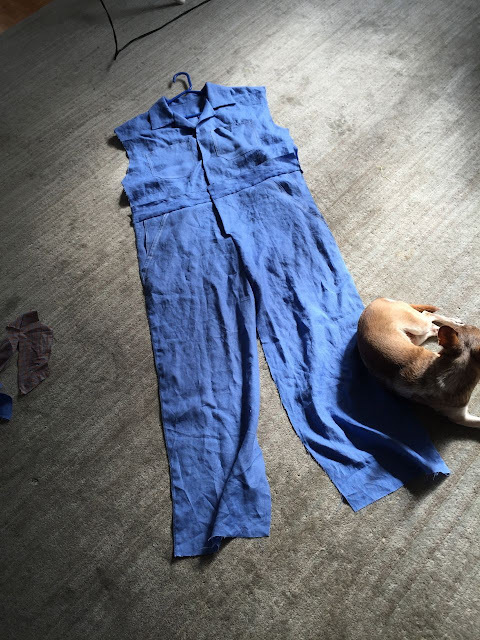 I've never seen coveralls as fashion but the photos in your post are kind of growing on me! Look like coveralls to me. I used to see men in the factory where I worked summers wear coveralls, especially if they worked in the paint room. Cool!!! I occasionally wear coveralls as clothing with a shirt underneath - Super comfortable! I've seen a few guys wearing coveralls at the mall as fashion but its a rare event. Usually I've seen them on guys at the garage. 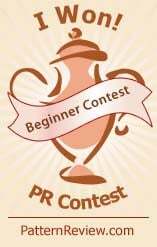 But the blue linen looks like a winner to me. You'll have comfort and style in one garment. I love when Freddie gets screen time. It just doesn't happen enough. Not enough, I tell you. How do you know which one is which? LOL! Lots of old guys, the kind who wear their belt about mid chest-height. It's not a good look. Please don't. Even Johnny Depp can't pull it off. I've never worn coveralls as fashion but I'm starting to like them. 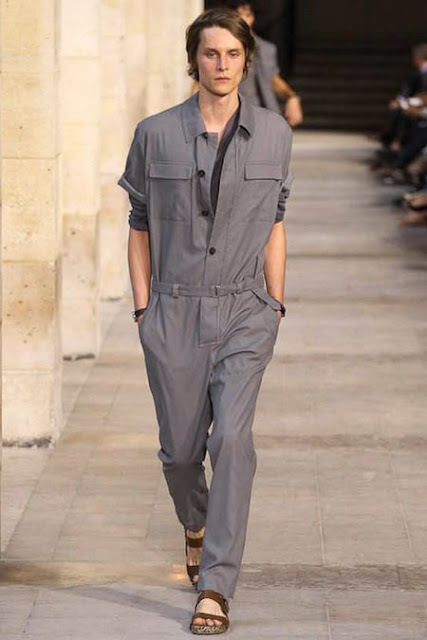 I might whip up myself a pair of coveralls in the Hermés or Levi's (right model) style in the pictures you have here. Hmm. that first inspiration pic has been haunting me forever! he looks darn good. your blue suit is looking great so far. I've seen plenty of men wear coveralls but not as fashion. 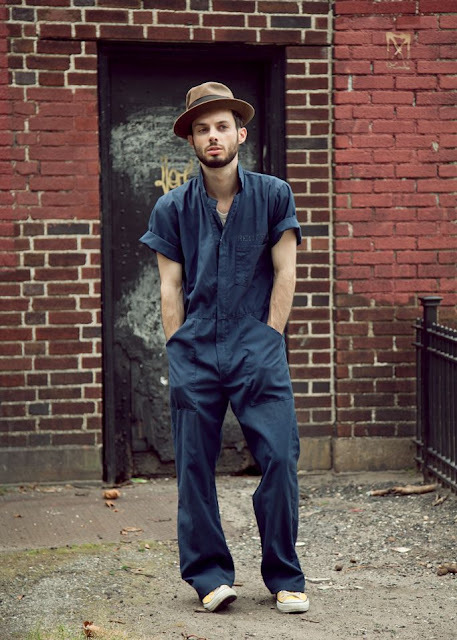 I think I've seen one or two guys who might be fashion students (or something similar) wear jumpsuits (indeed, I think the difference is in wearing it over other clothes or not. I think it's only a coverall if you can take it off in public) and looking sort of like the inspiration pictures you've posted. I've been wearing jumpsuits as fashion myself for years but of course women often get away with unusual fashion more easily. I think this is a great look. Louis Vuitton did a shorts version a couple of seasons ago that had a military / safari vibe. I'm still tempted to go there. Can't wait to see how yours turns out. What a great start! I recently bought David Page Coffin's new workbook on shirts and find you featured in it...page 77...Woo Who! i always tend to think that you call them overalls f they are on some burly bloke fixing his car. however some of those models wearing them look fabulous! I've made jumpsuits and I find the best method is to do the top and pants separately and then join them at the waist. I usually put belt loops on that seam so its covered by the belt. I get a great fit using this method. 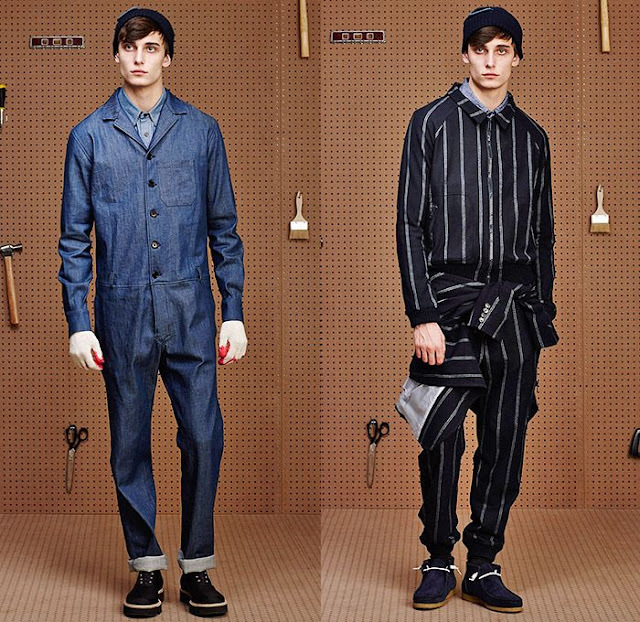 Coveralls are a different story though.......the guy in the second picture looks great in his! Perhaps it's time for a posting on your blog, showcasing the fit, flare, and smartly belted hidden seam. Hmmmmm??? Oh you got me good Test! LOL!! I haven't posted a single word there in months, but I promise I will soon. Boy! The way Peter keeps churning out these clothes, I can't help but catch his spirit of motivation! Thanks Peter!! [bleary eyed] A little over 8 months, (pauses and softens voice), but who's counting? My husband had a pair of Carhart coveralls- insulated, so a little puffy- he wore while building a house. In winter, in Chicago. I remember his boss calling one morning to say they weren't working that day, as it was around 0 degrees out. I told him too late, he's already gone! He worked all that day :). He said they were great, except using the Blue Boy was a pain :0 ! Hopefully you'll be posing the finished result with Freddie at your feet! All your inspiration garments have quite a bit of "slouch" to them. Most of your personal garments are quite fitted, as is the pattern. Shortening the rise may drop the waist and make them more current and less work-wear, but if you took out too much you won't get the slouchy effect, no? Maybe it's time to design a pocket logo too! Yep, I'm also wearing wood shoes, which surely is the next big thing to come after worksuits in the fashion world. I wear worksuits (with a T shirt under usually) four days a week, even though that is not required by the work I do. I just think they look cool and industrial-chic. My oldest one that is continuous use I bought 20 years ago at a used clothing store when I came to Boston for college; I've been told it is a Hydro Quebec coverall. Another one was given to me by a friend when she was going through her granddad's stuff after he passed away, since she knew I was a worksuit aficionado. I've sewn a couple too, but save wearing them for special occasions. One time I wore a fancy one I made with gray suiting and black satin trim to a wedding. Anyway, love the fabric choice and color. 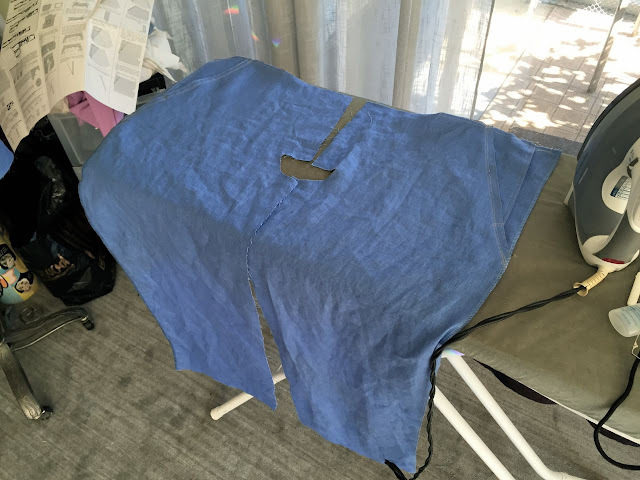 I thin blue is my favorite worksuit color; I've got two that are close to that shade. Wanted to say not to make it too fitted, particularly you want to leave a little extra ease in the shoulders to crotch seam dimension. This can make the crotch a little more baggy than you might like, but otherwise you get a wedge when you lift your arms or bend over. It is great wearing a giant onesie in many ways, but there are some additional constraints on the garment that you don't have with separate top/bottom. Having made myself a jumpsuit back in the day, like the 1970's, I've never wanted another. Of course men don't have to get undressed to pee. Were you always a clothing risk taker or only since you've started sewing? I love the fabric choice you've made for this; it takes it out of the realm of the garage. My dad wore coveralls for work as a machinist, every day, and a jumpsuit for leisure at home, every day. (Well, he had one suit for funerals.) 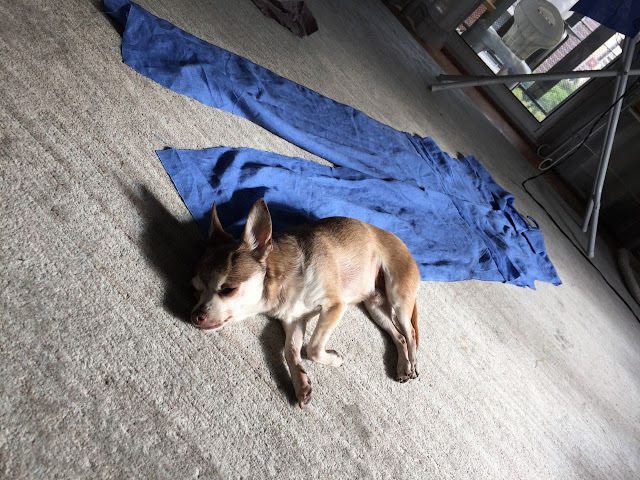 Anyway, he always looked nice, and was so pleased when--in his seventies--a young waitress at a cafe complimented his jumpsuit and said she wanted her boyfriend to wear one. 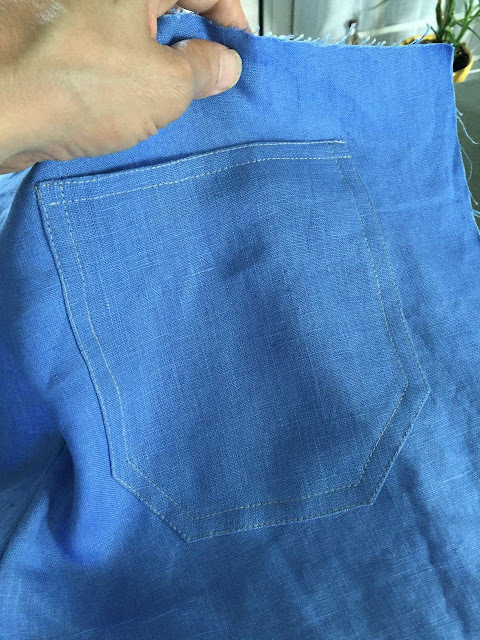 Definitely--a pocket logo. Also, think about seersucker or khaki versions, too! 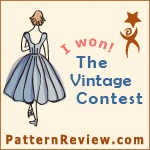 The fabric is beautiful and the inspiration sources are great! I am sure it will come out very handsome. I need to find some appropriate camo fabric, fusible fleece insulation and some sort of comfortable lining material for a hunting coverall I have in mind. I am tired of buying the not-so-cheap but poorly made imported hunting clothes. Your Kwik Sew pattern should do nicely if I add some pockets and zippers on the legs for storage. Thanks for the insppiration! In another color these would look more trendy-fashionable, because in my opinion these remind me of the blue coveralls of workers in Europe. So don't wear them in Europe unless you want to be mistaken for a tradesman! However in NYC, worn with something intentionally non-worker I'm sure you'll look great. Your workmanship is superb! Love it! I recently saw a dress that was converted coveralls. 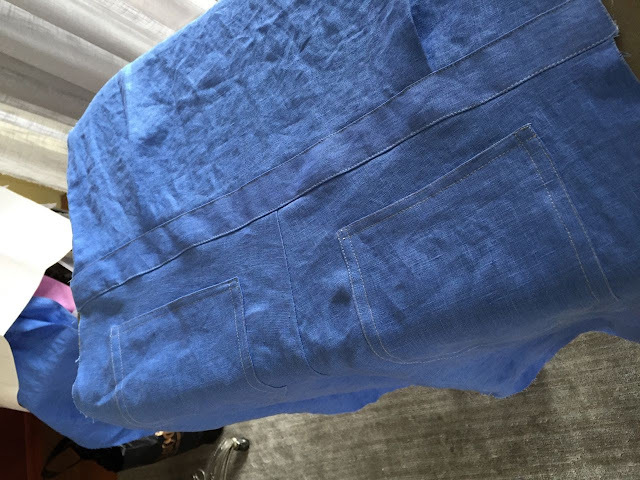 Just cut it like we used to make jeans skirts by opening the crotch seam and lapping or cutting it straight. Only problem with a jumpsuit, going to the bathroom. But I'd wear inspiration #1, that grey low-rise dropped waist look is fabu! Hi, I'm currently using this pattern and I am struggling with the collar instructions. The instructions starts from number 4 until 5. If you could explain it in an easier version could you please help me? And last of all, the pattern has 1.5 seam allowance. I sewed it in 1.5 seam allowance everywhere is that correct? Yes, you want to use a 1.5 cm seam allowance all the way around. This is equivalent to 5/8". Not sure where you're having problems with the collar. 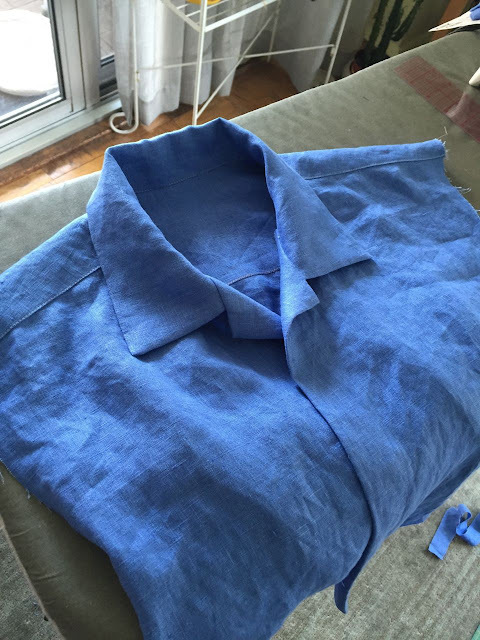 If you've ever made a convertible collar shirt, it's the same process. You make the collar, baste both layers to the neckline up to the notch (the part the facings will cover) and then only the under layer. 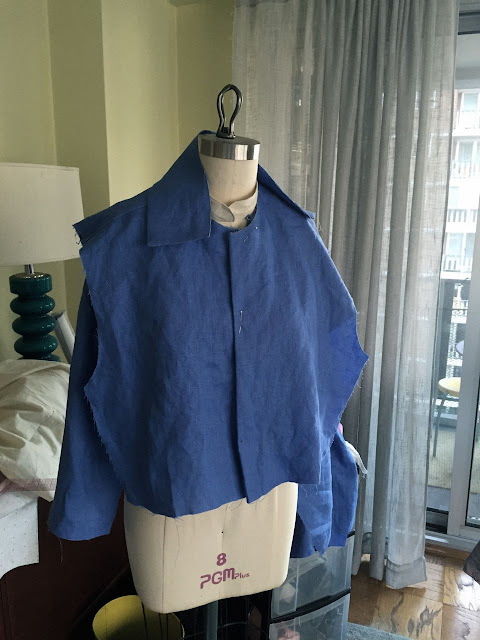 The top layer part that hasn't been stitched will get folded under and edgestitched, leaving you with a clean finish. Hope that helps! I bought this same pattern and cut out the fabric over a year ago and just now decided it was time to finish it. I found a funky striped flat sheet with all the harvest colors of the seventies at a church yard sale for fifty cents. Luckily my husband has a sense of humor and doesn't mind working in the heat on our chicken farm looking like a dead-ringer for Sonny Bono, only taller. I swear Peter Brady had a pair of stripey pants just like my sheets! You did better on the collar than I did. I must have missed a step and left some loose edges on the outside. Now that I've seen your pictures, I'm going back to fix the collar. Don't want the chickens laughing at Sonny! I went through 4 spools of thread doing all that double top-stitching, ranging from a light orange to a pale yellow, in keeping with the crazy stripes. In all, my investment was $10 for the pattern, $3 for the zipper and 50 cents for the fabric. For $13.50, he is ready for the chicken farm runway. I think I'll add a nice embroidered "SONNY" on the chest pocket to give it a bit of flair. Thank you for sharing your story! I'm glad people still sew. I am currently going to start my jumpsuit project. I am a man who likes to sew. I am making mine for many reasons. One of which is I am a prepper and I just feel like a pair of coveralls/jumpauit would come in handy. Looks like yours are turning out so far. Good job.